Enjoy reduced rates on select Europe departures. Prices shown reflect discount. Click here for eligible departures. Our ship will cruise to Emmerich-am-Rhein. This morning, join us on an excursion for both packages: Guided tour of the open-air museum in Arnhem. We'll return on board in Wesel and spend the afternoon cruising to Düsseldorf. Enjoy an evening of entertainment. We'll depart early this morning for Cologne. Join us on an excursion for both packages: Guided tour of Cologne. 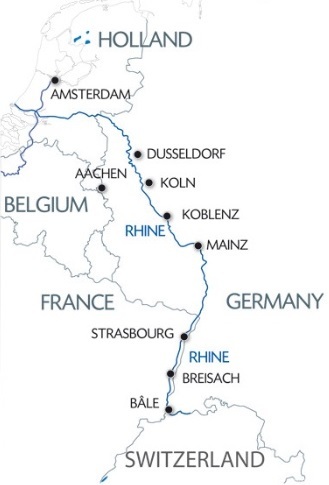 Our cruise will then continue along the Rhine to Koblenz. In the evening, enjoy some free time to stroll through the town towards the famous Deutsches Eck. CLASSIC: Guided tour of Colmar and the Unterlinden Museum (2). Join us on an excursion for both packages: Guided tour of Basel. (1) In 2019, the Keukenhof Gardens will be open from March 21st to May 19th. (2) The museum is closed on Tuesdays. It will be replaced by a visit to the Hansi Museum instead.